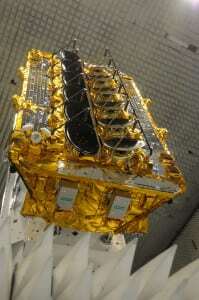 [Via Satellite 08-18-2015] O3B Networks is planning on ordering more satellites and releasing new antennas to bolster its Ka-band High Throughput Satellite (HTS) network in the near future. Steve Collar, CEO of O3b, told Via Satellite that the company intends to increase its capacity in space in the near future. “We are absolutely working on that, as well as on further development of our constellation beyond the next set of satellites. We have a long-term vision for O3b. I have said that we will announce the next phase of our growth before the end of this year and we are very much on track,” he said. 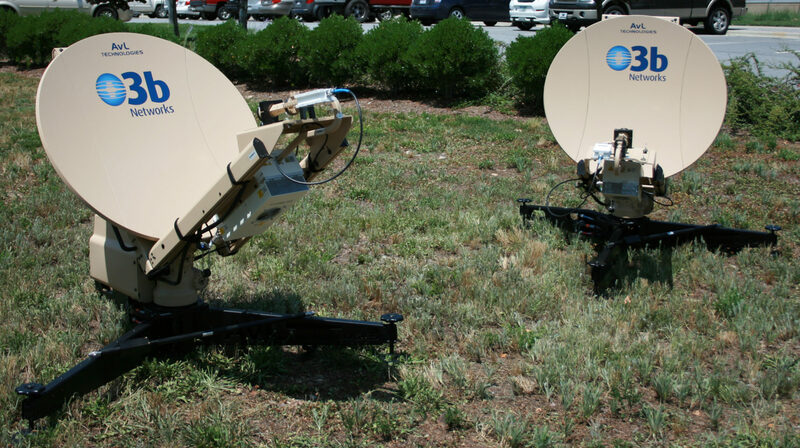 In addition to new satellites, Collar said new antenna systems are also under development. The soonest to release commercially is a land transportable antenna system developed by AVL Technologies that was revealed at the SATELLITE 2015 Conference and Exhibition. The 85 cm antenna can deliver 400 Mbps with a 90-minute set up time, and can be transported by two people in a case. “That’s the thing I am most excited about at the moment because it’s the thing that is probably closest to the market. There are a bunch of other things we are working on both in the area of ground systems and antennas and in other related areas, which are also exciting, but are a little further away from prime time. The AVL solution is something now that’s being actively marketed,” said Collar. O3b also set up a development contract with Kymeta in September 2013 to work on a flat-panel technology compatible with O3b’s constellation of Medium Earth Orbiting (MEO) satellites. Collar said O3b and Kymeta continue to collaborate on flat-panel technology applicable to O3b. Collar said the undisclosed antennas under development consist of both flat panel and more traditional antennas, but “not exactly what you would think that means in mechanically steered antennas.” He said O3b is making substantial investments in ground segment and the company’s overall network, which should culminate in new products coming to market within the next 18 months. 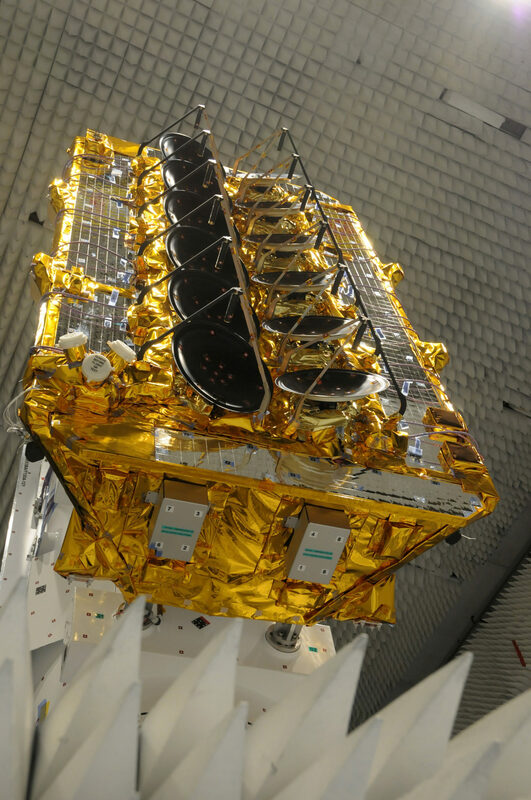 O3b has continued to grow in prominence within the satellite industry, touting its MEO network’s ability to reduce latency down to roughly 120 milliseconds compared to the approximately 600 milliseconds typically associated with geostationary systems. SES is a partial owner of O3b, and has found the MEO system complementary to GEO. Giles Thorne, equity analyst at Jeffries, anticipates SES could make a move soon to increase its ownership of the company. O3b satellite testing in the anechoic chamber. Photo: O3b Networks. “[SES] management have repeatedly said SES would wait to see evidence of commercial success before consolidating O3b … more recently, management have spoken of moving to control in 2016. We now see this whole agenda as being accelerated to 2015. In doing so, SES has much to gain: 1. it obfuscates a softer revenue environment by changing the perimeter of 2016 guidance; 2. it bolsters top-line expectations (and investor sentiment) by bringing O3b’s double-digit growth (‘not beginning with a 1’, so the CEO tells us) onto the SES [profit and loss] P&L; 3. it gets to hide the murky fixed data cannibalization/seeding to O3b behind the scenes; and 4. perhaps most importantly, it focuses the market and stakeholders on SES’s unique ability to do FSS-GEO, HTS-GEO and HTS-MEO, a source of real long term differentiation,” Thorne wrote in a July 24 investor note. Collar said O3b’s value is now more prominent thanks to the increase in customers testifying to its service. Several telecom customers in emerging markets have grown their networks by threefold or more within the first few months of service. About 60 to 70 percent of O3b’s customer base is concentrated in emerging markets. Other verticals have grown in significance as well. From July 2013 to June 2015, maritime increased from 17 percent to 30 percent of O3b’s backlog. Energy went from nothing to five percent. Going forward, O3b is seeking in particular to grow its government business. “That market has been capacity constrained, solution constrained and somewhat budget constrained for a number of years and, as a result, I think government solutions are a little behind the curve when compared with commercial solutions. 600 Mbps on a cruise ship versus 20 Mbps on an aircraft carrier is a great example of that. Both have about 6,000 people on board. I think O3b will offer governments’ situation awareness and data processing capabilities in remote and war-torn areas that will make a major difference to their operational response,” said Collar. Declines in government spending have made the military market a challenging environment for several operators. Collar said the government is increasingly looking to stream high-definition videos from Unmanned Aerial Vehicles (UAVs), rather than transport content physically, which could trigger greater interest in O3b services. In addition to military, Collar highlighted emergency response as an area the company is looking to be more active. “If you think about earthquakes in Nepal or Japan, or even a domestic situation in the U.S., I think the ability to bring a Gbps within 24 hours anywhere in the world is something that no one else can do, and offers the potential for people wherever that emergency is to start helping themselves rather than it just being enough bandwidth for the emergency responders,” he said.